Mortgage markets improved last week as Wall Street’s concerns about the Middle East trumped its fears of inflation. Conforming and FHA mortgage rates in Utah fell to a 3-week low. Last week marked the second straight week in which mortgage rates fell, a streak that follows four straight weeks of climbing mortgage rates. It’s been a bout of good fortune for rate shoppers and home buyers. In addition, according to Freddie Mac’s weekly mortgage rate survey, the average spread between conforming 30-year fixed rate mortgages and 5-year ARMs has widened further. The two benchmark products are now separated by 1.15%. It’s the largest interest rate gap in recent history; one that yields a monthly payment difference of $68 per $100,000 borrowed. This week, it’s unclear in what direction mortgage rates will go. 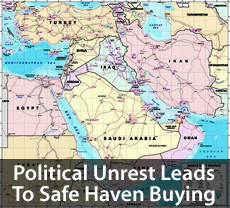 On one side, there’s ongoing unease related to protests in Libya and its neighbors, and that’s driving safe haven buying. “Safe haven buying” describes when investors flee risky situations and put their money in the safest places possible. Mortgage bonds are one such place, so when safe haven buying is in effect, bond demand is high so bond yields (i.e. mortgage rates) fall. On the other side, inflation is ramping up. Recent economic data shows that the economy is expanding, and the Federal Reserve is maintaining its accommodative growth policies. 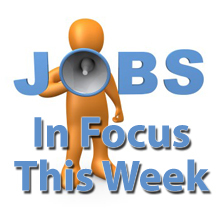 Therefore, this week, the key economic event will be Friday’s jobs report. if job creation is high, expect inflation fear to re-ignite, and mortgage rates to rise. Another risk factor for this week’s rate shoppers is that tensions begin to settle in the Middle East, or that Wall Street gets more comfortable with rising oil prices. If that happens, safe haven buying will subside and mortgage rates will resume rising. There appears to be more reasons for mortgage rates to rise this week than for them to fall. Plan accordingly. If you have not locked a mortgage rate yet, this week may represent your last chance to get a low one. Talk to your loan officer and make a plan. Not all housing reports are sunny, it seems. In its monthly New Home Sales release, the U.S. Department of Commerce showed a 13 percent drop-off in annualized new construction sales between the months of December and January. It’s the biggest one-month drop in New Home Sales since May 2010. In addition, the supply of new homes for sale spiked higher to 7.9 months last month. “Home supply” is defined as the amount of time it would take to sell the complete “for sale” inventory at the current pace of sales. Don’t fret the news, however. For buyers of new construction , falling New Home Sales figures can be terrific. Weaker markets put pressure on the nation’s home builders to sell their respective homes more quickly. To reach that goal, builders often discount prices and/or offer free upgrades to buyers. Some of that action may already be in effect. Despite falling volume, the New Home Sales report showed that new homes are selling faster than in recent months. The median time required to sell a newly-built home dropped to 7.8 months in January — a figure well below January 2010’s reading of 13.9 months. It suggests that builders are getting better at locating buyers, and moving property. Therefore, if you’re shopping for a new construction and see one worth buying, get to it. Not only will the home likely sell soon if it’s priced right, but an increase in mortgage rates will make the home more expensive to finance. Every 0.250% increase to rates adds $15 monthly per $100,000 borrowed. Home resales rose another 2.7 percent last month, according to the National Association of REALTORS® monthly Existing Home Sales report. An “existing home” is a home that’s been previously occupied and is not considered new construction. The number of existing homes sold on a rolling 12-month basis is now at its highest point since May 2010, the month before the federal homebuyer tax credit ended. It’s also up some 40% since July 2010, the month after the tax credit ended. But that’s not the biggest story in the Existing Home Sales report. 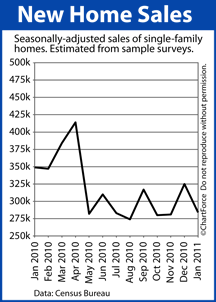 The precipitous decline in home inventory deserves more attention. 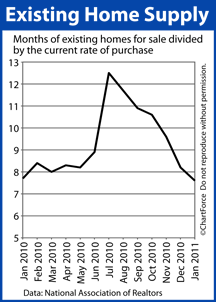 At the current pace of sales, the complete, national home resale inventory will be sold in 7.6 months. This is close to 5 months faster as compared to last year’s peak, and well below the 2-year home supply average of 9.0 months. There more buyers in the market, it seems, and fewer homes from which they can choose. Total home resale inventory is down to just 3.38 million homes nationwide — the fewest in 12 months. There were other interesting statistics in the official Existing Home Sales report, including a break-down of purchases by buyer-type. In addition, distressed sales — foreclosures and short sales — made up 37 percent of the market. Over the next few days, more housing data will hit the wires and it’s expected to show similar strength to January’s Existing Home Sales report. With falling supplies and a growing base of move-up buyers, home prices are expected to rise in the coming months ahead. Mortgage rates are up 0.875% since mid-November, causing home buyer purchasing power to fall more than 10 percent since. Persistent concerns over inflation are a major reason why and this week’s Consumer Price Index did little to quell fears. CPI rose for the third straight month last month. Wall Street was not surprised. As the economy has picked up steam since late-2010, the Federal Reserve has held the Fed Funds Rate near zero percent, and kept its $600 billion bond plan moving forward. The Fed believes this is necessary to support the economy in the near-term. Over the long-term, however, Wall Street worries that these programs may cause the economy may expand too far, too fast, and into runaway inflation. Inflation pressures mortgage rates to rise. Inflation is an economic concept; defined as when a currency loses its value. Something that used to cost $1.00 now costs $1.05, for example. It’s not that the goods themselves are more expensive, per se. It’s that the money used to buy the goods is worth less. Because of inflation, it takes more money to buy the same amount of product. This is a big deal in the mortgage markets because mortgage rates come from the price of mortgage bonds, and mortgage bonds are denominated, bought, and sold in U.S. dollars. When inflation in present, the dollar loses its value and, therefore, so do mortgage bonds. When mortgage bonds lose value, mortgage rates go up. Inflation fears are harming Utah home buyers. The Cost of Living has reached a record level, surpassing the former peak set in July 2008. Mortgage rates would be rising more right now if not for the Middle East unrest. So long as inflation concerns persist, mortgage rates should trend higher over the next few quarters. If you’re wondering whether to lock or float your mortgage rate, consider locking today’s sure thing. Mortgage markets improved slightly last week, rebounding from the worst 1-week loss in recent history. The gains were geopolitical, however; the result of instability in the Middle East region. Economic data was overlooked as investors made a broad-based flight-to-quality. For just the second time in 2011, conforming mortgage rates fell on a week-to-week basis. Furthermore, the just-released January FOMC Minutes showed an improving economic outlook from members of the Federal Reserve. Therefore, home buyers and rate shoppers might consider last week’s rate drop a gift. Without the growing unrest in Libya, Egypt and Tunisia, mortgage rates would have moved considerably higher. Instead, rates fell in a bout of what’s commonly known as “safe haven” buying. In safe haven buying, global investors shun risk in favor of safer investments; usually in response to market uncertainty. Terror threats is one such event. Regime overthrow is another. Because the event’s long-term effect on markets is unknown, investors choose to move cash to safer asset classes until the future is more clear. The extra demand for such assets drives prices up and, in the case of mortgage markets, drives rates down. Last week, rates fell because safe haven buying was so strong. That may not be the case this week. As events play out across the globe, mortgage rates at home in Utah will be affected. There’s a lot of economic data set for release this week, including a large series of housing-related figures. Stronger-than-expected data should cause mortgage rates to rise, safe haven buying notwithstanding. If you’re still shopping for rates, or looking for a last chance to lock a low rate, now may be your best chance. Talk to your loan officer about a rate-locking strategy early in the week. As the situations abroad become more clear, mortgage rates should start to climb once again. 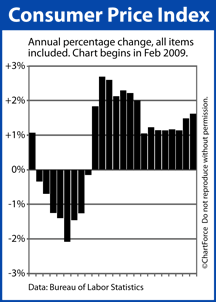 The Federal Reserve released its January 25-26, 2011 meeting minutes Wednesday afternoon. Utah mortgage rates have been in flux since. Fed Minutes are comprehensive recaps of Federal Open Market Committee meetings; a detailed look at the debates and discussions that shape our nation’s monetary policy. As such, they’re released 8 times annually; 3 weeks after the most recent FOMC meeting. Fed Minutes can be viewed as the unabridged version of the succinct, more well-known “Fed Statement” that’s released to markets immediately post-adjournment. Just how much more lengthy are Fed Minutes? 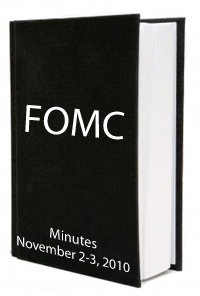 If the Fed Statement is an executive summary, the Fed Minutes is a novel. And, the extra words matter. When the Federal Reserve publishes its minutes, it’s offering clues about the group’s next policy-making steps. As an example, in the January minutes, the Fed improved its outlook for economic growth; lowered its projections for the Unemployment Rate; and removed its concern for deflation. In addition, the Fed discussed the potential for food-and-energy-cost-induced inflation, but labeled it as a minor economic risk at this point in time. Bond markets are mixed on the text of the Fed Minutes. Although the Fed indicates a willingness to allow inflation to occur, it appears ready to act in case inflation goes too high. One way that the Fed responds to rising inflation is to raise the Fed Funds Rate and many economists believe this will start happening by late-2011 or early-2012. Annualized Single-Family Housing Starts dropped 1 percent in January to 413,000 units nationwide, it’s lowest reading almost 2 years. A “Housing Start” is defined as a home on which construction has started. Now, if you had only seen the Housing Starts story in the headlines today, you wouldn’t have known that single-family starts fell at all. It’s because of how the story is being reported. Most commonly, newspaper headlines are reading something similar to “Housing Starts Jump 14.6%” with the lead paragraph making mention that “housing starts are at their highest levels in 4 years”. It’s a true statement, but it’s misleading, too. This is because, despite the Census Bureau reporting Housing Starts by property type — single-family, multi-family, and apartments — the media often lumps them into a single data set. It’s a categorization that helps investors in homebuilder stocks, but it does little for everyday home buyers. The huge majority of buyers aren’t buying multi-units or whole apartment buildings — they’re buying 1-unit homes. Clearly, the surge in Housing Starts can be attributed to the rapid rise in the 5-unit-or-more sector. Single-Family Starts were weak, by comparison. Even with all of this noted, however, we can’t even be certain that the January Housing Starts data is accurate anyway. A footnote in the government’s report shows that, although single-family starts are said to have decreased 1 percent, the data’s margin of error is ±8.6%. 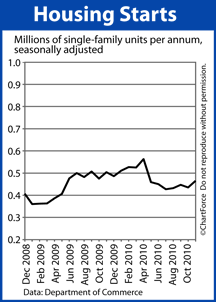 This means that the true Single-Family Housing Starts reading may be anywhere from -9.6% to +7.6%. The data is throw-away. 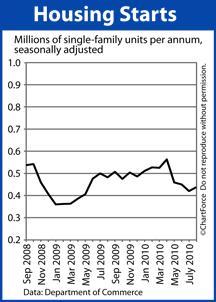 Housing Starts may have actually increased in January, but we won’t know until revisions are offered later this year. Homebuilder confidence in the market for newly-built, single family homes appears stable as the spring buying season gets underway. 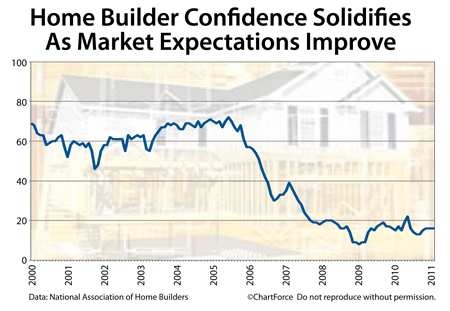 The confidence reading is recorded and reported monthly by the National Association of Homebuilders. For the 4th straight month, the group’s Housing Market Index reads 16. As a market indicator, Housing Market Index has been tracked for more than twenty years and reports on a 1-100 scale. A value of 50 or better indicates “favorable conditions” for home builders. HMI hasn’t read higher than 50 since April 2006. Broken down, the Housing Market Index is actually a weighted composite of 3 separate surveys measuring current single-family sales; projected single-family sales; and foot traffic of prospective buyers. February’s surveys showed slight improvement as compared to January, overall. It’s notable that the current sales levels were higher in February, and that projected sales levels for the next 6 months are higher, too. For home buyers Utah across , this month’s Housing Market Index reading may foreshadow tougher negotiations in the months ahead with builders. The likelihood of getting discounts and free upgrades may be diminished as builders see their respective sales levels grow, and as the economy expands. Coupled with rising mortgage rates, home buyer purchasing power may never be as high as it is today. Therefore, if your plans call for buying a newly-built home this year, think about moving up your time frame. Builder confidence appears to have bottomed. As it rises, so should home prices. If consumer spending is a keystone element in the U.S. economic recovery, a full-on rebound is likely underway. Tuesday, the Census Bureau released its national January Retail Sales figures and, for the seventh straight month, the data surpassed expectations. 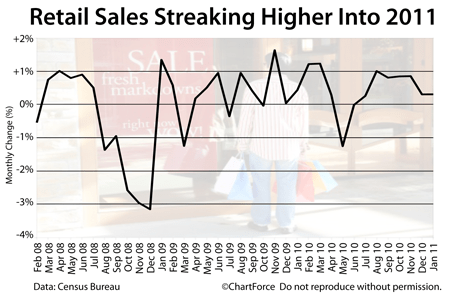 Last month’s retail figures climbed 0.3 percent as total sales receipts reached an all-time high. It’s good news for the economy which is scratching back after a prolonged recession, but decidedly bad news for people in want of a mortgage across the state of Utah. This includes home buyers and would-be refinancers alike. Because consumer spending accounts for the majority of the U.S. economy, Retail Sales growth means more economic growth and that draws Wall Street’s dollars toward riskier investments, including equities, at the expense of safer investments such as mortgage-backed bonds. On the heels of the Retail Sales report’s release, bond prices are falling this morning. As a consequence, mortgage rates are rising. It’s the same pattern we’ve seen since mid-November — “good news” about the economy sparks a stock market frenzy, casuing mortgage bonds to rise. The days of 4 percent, 30-year fixed rate mortgages are over. 5 percent is the new market benchmark. Unless the economy keeps showing strength. Then, that number may rise to six percent. If you’re thinking of buying or refinancing a home, consider how rising rates will hit your budget. You may want to take that next step sooner than you had planned — if only to protect your monthly payments. Mortgage markets worsened terribly last week. Amid more reports of an improving economy and fears of pending inflation, mortgage rates skyrocketed to their highest levels since April 2010. According to Freddie Mac, mortgage rates made their largest 1-week jump in more than a year last week, tacking on 0.24 percent and bringing the average national 30-year fixed mortgage rate up to 5.05%. In some markets, rates are even higher. Since bottoming out in Freddie Mac’s November 11 survey, conforming, 30-year fixed mortgage rates are now higher by close to a full percentage point. Home buyers across the nation have lost more than 10% of their purchasing power during that time. Rates have also been on a historic run higher, increasing over 9 consecutive days for the first time in almost a decade. That streak ended Friday with rates dropping slightly, and rate shoppers are hopeful the momentum lower continues into this week. It’s not likely. The week is loaded of housing data and housing has been trending better. More strong figures will bolster stock markets at the expense of bonds, driving mortgage rates higher for the 4th week in a row. In addition, inflation-related figures will be released. That, too, can have a negative impact on mortgage rates. Markets should increase in volatility as the week progresses because of the looming 3-day weekend. Volume will be light Friday in advance of President’s Day. If you haven’t yet locked your mortgage rate, the time to act is soon — possibly now. Mortgage rates are well off their historical lows, but still relatively inexpensive. Before long, that may no longer be the case. You are currently browsing the KeithSargent's Blog blog archives for February, 2011.